Young people facing an uncertain future in a challenging job market are being given the opportunity to become owners and shareholders in a new skin care business. JooMo is the first 100 percent truly natural face wash – considered the Holy Grail in cosmetic formulation. Designed especially for young skin, the face wash deals with existing skin problems such as spots, repairs the damage caused by synthetic products, then rebuilds the skin’s natural defences. Now the developers are looking for entrepreneurs aged between 16 and 24 to not only sell the product, but eventually take over the company, which aims to be a co-operative enterprise run by young people for young people. Rather than becoming reps or affiliates, the young salespeople will be invited to join Team JooMo, giving them a stake in the business, a share of the profits, and a say in how the co-operative is managed and grows. With youth unemployment running at 22 percent, the founders of JooMo say the formation of the co-operative is not only an ethical choice, but a smart business decision too. Co-founder Linda Russell said: “There are very talented people coming through colleges and universities, but for many the prospects of employment are not good. “We are looking for young people with entrepreneurial spirit who want to make money, learn real business skills and be part of an ethical company. “They can sell by word-of-mouth, through social networking sites like Facebook, or set up a stall at college events. “They can make selling their full time job, or just earn a little extra money while continuing their studies. “With an investment of £50 for marketing materials and demonstration products to get them started, they can sell as much or as little as they like, and buy products at a wholesale price when they have orders to fulfil. Linda’s partner, Nick Wallen, said: “This is a brilliant world-beating product, developed for the teen to 24 market. “It is completely natural and effective; free of foamers, preservatives and chemicals which irritate young skin, making it safer and more effective than anything else out there. The idea for a face wash came when Nick, who has a degree in chemistry, and Linda, who has a marketing background, struggled to find products for their teenage sons. “We identified a need and decided to fill a gap in the market,” said Nick. Young people have been involved in JooMo from the outset. The formula was developed with the help of the Universities of Surrey and Leeds, and students from the University of West London created the branding. JooMo is “Made in Britain, Created in Britain and Designed in Britain”, which will create more jobs for young people, while the suppliers of the natural ingredients come mainly from the developing world, in keeping with JooMo’s philosophy of encouraging “Trade not Aid”. 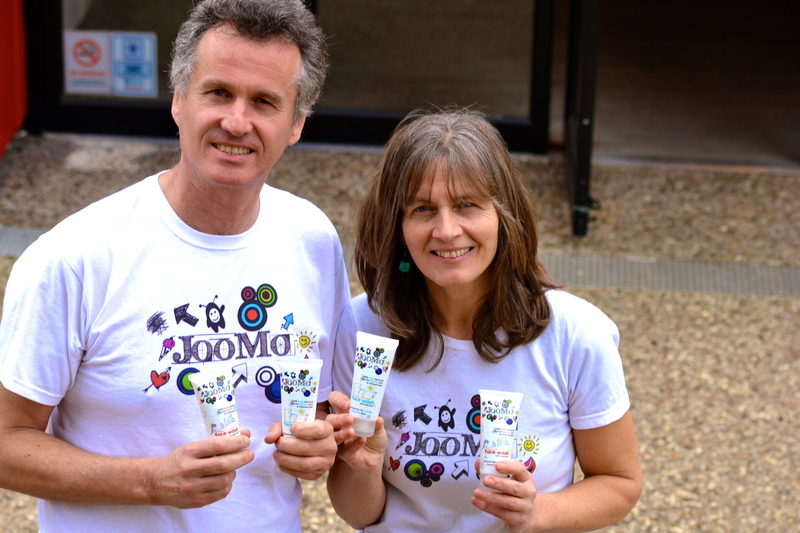 And Nick and Linda’s ambitions for their team of young entrepreneurs go further than making and selling JooMo products. Eventually they would like to see young people electing their own management committee and running the business themselves. The JooMo co-operative was founded with the help of Co-operative Futures, with funding from the Co-operative Enterprise Hub. Co-operative Futures director Jo White helped develop the co-operative structure and provided continual business advice. “Her input has been constructive and imaginative,” said Nick. This entry was posted in Business, Co-operative, Young people and tagged business, Co-operative, ethical, Made in Britain, natural face wash, youth unemployment. Bookmark the permalink.